The world of collaborative commerce has become very exciting with the innovations in creating new customer experiences by leveraging the Internet of Things(IoT). Amazon Go stores where you can walk in, pick up the items you need and walk out without interacting with any human is a great example of what can be achieved by leveraging IoT. Customers purchasing tickets from a movie theater kiosk from their smart phones without touching the kiosk or customers ordering /paying for food from their tablets without talking to anyone are some of the potential applications of collaborative commerce. So, what is Collaborative Commerce? Collaborative commerce happens when the consumer and the merchant are in communication with each other during an in-person shopping transaction for the entire life cycle of the experience. This may involve merchant presenting an offer, customer browsing the menu, ordering, paying and getting updates from merchant on the order fulfillment real time. This ability of having a real time communication between merchant and customer during in person shopping benefits both the merchant and customer. The merchant can understand the customer behavior better, provide targeted offers, gets an accurate picture of the demand and customers can benefit from finding out the best deals, avoid standing in lines and can pay from anywhere and using any pay instrument. The merchant may be an attended system where there is a human accepting order/payment from the customer or an unattended system where the merchant is a kiosk, vending machine or an ATM. A customer ordering and paying for food while entering a drive way is an example of attended system collaborative commerce while a customer purchasing a car wash in a automatic car wash bay is an example of unattended system collaborative commerce. A customer device/sensor acquires the data thru various form factors such as zip code based search, BLE (Bluetooth Low energy) signal, Geolocation or as simple as a QR code scan. Once this connection between merchant and customer sensor/device is established then the merchant can push the offers, customers can get the menu or compare the deals. This can be a mobile phone, tablet or a specialized sensor built to collect the data. Customers can view the menu, browse the products offer and use the specific payment method to complete the transaction. This is where the business logic behind merchant offers, inventory, customer payments etc. is stored. A cloud server is the brain behind this Collaborative commerce IoT platform and is usually an API / messaging based platform. The cloud server is integrated with a Payment gateway to complete the payment transaction. The merchant PoS is where the orders are received from the cloud server with the required details. This is just an overview of the basic architecture without diving deeper into the security and the communication protocols but gives you an idea of the framework. Innovecture has built a Collaborative commerce platform using which multiple applications/products can be launched to conduct Collaborative Commerce in a secure way. 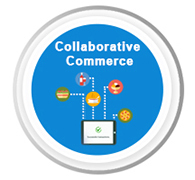 Know more about Innovecture Collaborative Commerce platform and it’s benefits. The Client owns a chain of restaurants and at the time of the requirement was looking for a solid solution to be able to attract customers using smart phones for ordering food.